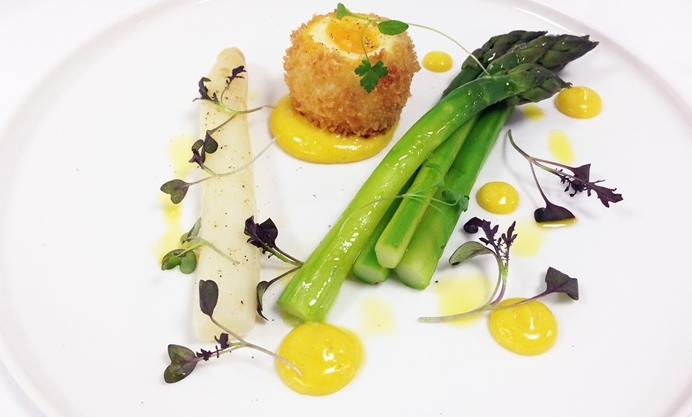 Discover why Hayden Groves believes English asparagus to be the king of seasonal vegetables. He also shares a beautiful recipe making the most of the new season's crop. Like most chefs I always get excited when the first of the asparagus comes to the kitchen. This year because of the mild winter weather the season has started a little earlier, although what we have had to this point has mainly been poly tunnel grown from the Wye Valley. We are just starting to see the first serious outdoor crops at market and once the warm weather is in full swing asparagus will grow fast and furious up to 3 inches a day resulting in fresh, tender spears that need regular picking. This continues until the traditional final cutting on Summer Solstice, 21st June. However, as Yoda said, ‘no, there is another'; a lesser known Autumn crop has popped up over the last few years and thanks to John Chinn, a pioneering farmer from the Wye Valley, a new variety of British Autumn asparagus is born. This is now commercially available from September until November. This reverse season, and by using a hybrid of a Mediterranean strain of the plant, has taken him some 7 years to develop. Call me old fashioned but this vegetable witchcraft will never generate the same feeling as sitting on a terrace in late Spring, chilled glass of white in hand and a simple plate of asparagus. A member of the Lily family, earliest records of asparagus cultivation trace back to Greece some 2,500 years ago. The Greeks believed that asparagus possessed medicinal properties, the ‘Asprin’ of the vegetable world and recommended it as a cure for toothache. It was also highly prized by the Romans who grew it in high-walled courtyards and it has been grown in England since the sixteenth century. Asparagus is very popular with our European chums although their preference is for white. To cultivate they turn to the dark side of the force. The shoots are covered with soil as they grow; without exposure to sunlight there is no photosynthesis and the shoots remain white in colour - I knew those school science classes would eventually pay off! Green asparagus doesn’t need to be peeled however its fibrous skinned white cousin always must be, so not to waste the flesh use a fine gauge peeler all the way to just below the tip. 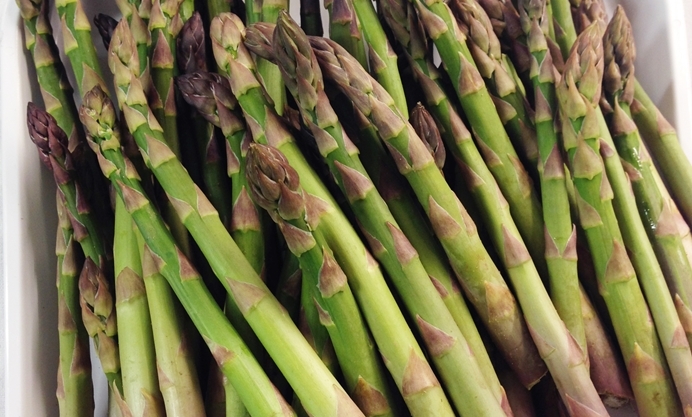 English Asparagus at its best, like most great things in life, requires minimal fuss -steamed, grilled or poached in a butter emulsion, even shaved and used raw as a garnish or in salads. Look for firm but tender stalks with good colour and closed tips, thin stalks are not necessarily better, in fact thicker specimens are often preferable due to the smaller ratio of skin to flesh. Once picked, like most vegetables asparagus rapidly loses flavour and tenderness with the sugars turning to carbohydrate and it begins to develop a slight floury taste - that’s why fresh is best! It really is worth eating as close to the day it is picked. If that isn't possible store asparagus in the fridge with a damp paper towel wrapped around the bottom of the stalks and you can get away with keeping it for a couple of days. ‘Asparagus and Eggs’ are best mates with the classic pairing of Hollandaise sauce. They share part of their season with another favourite of mine - pheasant eggs. These are smaller than a hens egg but with a rich yolk and make a fantastic starter dish. If you are not familiar with virgin rapeseed oil, another ingredient in the recipe, it's not just British but even healthier than olive oil. It is high in omega 3 and 6 and an excellent source of vitamin E and has a light nutty flavour and a brilliant bright yellow colour. As the oil of choice in my mayonnaise recipe for this dish, it’s almost like adding a touch of sunshine to your plate! Spoon on a generous dollop of mayonnaise and the crispy egg, add a scattering of parsley cress and peppery mustard frills to garnish.